As one of the first countries to welcome the New Year, Samoans embraced 2016 with singing, dancing, prayers and fireworks when the clock struck midnight on Thursday. While thousands packed into church services to give thanks to the Almighty for his guidance and protection for 2015, others chose to gather with families, friends and loved ones to greet the new year. 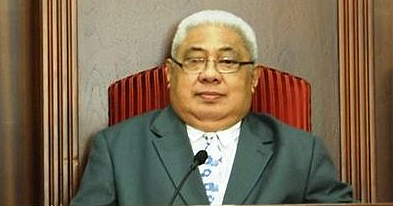 On national TV, Prime Minister, Tuilaepa Sa’ilele Malielegaoi, addressed the country, wishing everyone a happy 2016. “We farewell 2015 and take forward its lessons to the new year 2016 to further make safer our communities and to strengthen the development of our country,” Tuilaepa said. “I would like to acknowledge with gratitude the hard work and important contributions made by all our people whether through: the Church, village councils, the private sector and in government service to the development and cohesiveness of our country. In the Apia Township, the sound of church hymns prior to midnight was soon replaced by gunshots and horns heralding the arrival of the new year. The town’s bright lights burnt well into the early hours of the morning as the night revelers danced their troubles away away. For one night of the year, the neighbours did not mind the noise as families stayed up for an evening of merry making, fellowshipping and parties. Different people will have different takes on where is the best place in Samoa to celebrate new year. Savai’i though was a popular choice. For good reason. For one thing, the weather in Savai’i was much better. Although the big island got its fair share of rain, it was nothing compared to the downpours experienced in Apia. And if you thought fireworks are only found in Apia, think again. There were fireworks galore on the big island. One popular location was at Amoa Resort at Siufaga where Resort Owner Papali’i Paul Cafferelli greeted the new year with a spectacular show. A large crowd quickly gathered, with some of them witnessing a fireworks show for the first time. Another fireworks display took place at the nearby village of Fogapoa. But it’s not the fireworks that people will remember Fogapoa for this year. At midnight, villagers gathered in the middle of the village for its annual New Year’s eve tradition. It involves making loud noises through the beating of empty cans, drums and anything that could make a loud noise. The procession brought traffic to a stand still as villagers danced and beat their gallons in the middle of the road, welcoming the new year. 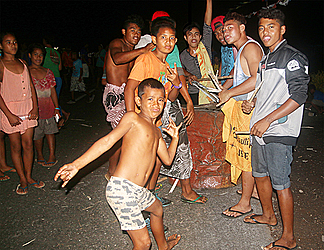 Villagers tell the Sunday Samoan that the tradition dates back many years and the Fogapoa villagers celebrate it religiously every year. Matai, women, untitled men and children all take part. The event begins at midnight and it goes until 6 – sometimes later – the next day. On Friday, the day started with thanksgiving church services for most villages. This was followed by church and village lunches, fundraisers and more merry making as Samoa embraced 2016.